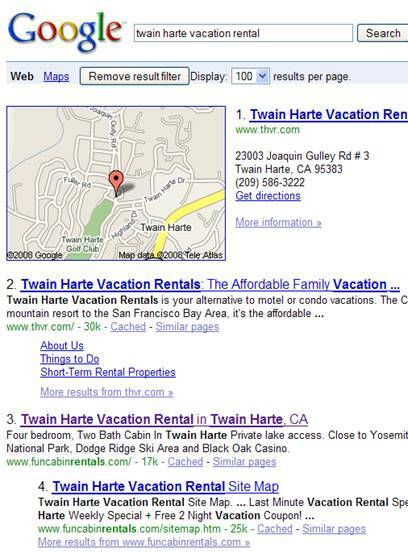 Have you ever wondered how to get a double listing in Google? You might want to start; my conversion rate skyrockets whenever I get a double listing in Google. Typically you’ll see about 6 of the 10 results on your screen when doing a search in Google (depending on your screen resolution). If you have a double listing you get 2 of those 6 Google search results, leaving only 4 other links for the searcher to look at (above the fold). By simply having that double listing, you have a better chance of the searcher clicking on your page and making a sale. So what’s the secret to these double listings in Google? The top factors for getting a double listing in Google are your title tags, and how often the word is used throughout the post. You want to have some of the words they are searching for in the meta title tag, meta keyword tag, meta description tag as well as spread throughout the content. 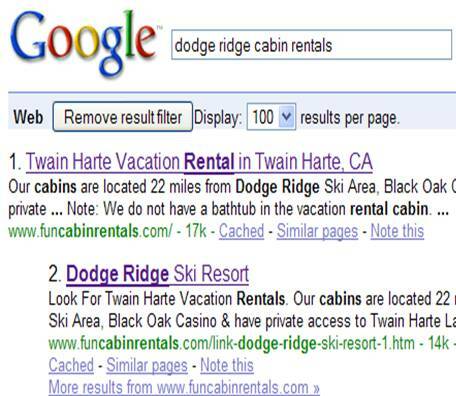 Notice how the results don’t have the “Dodge Ridge Cabin Rentals” Google search term in the title tag on listing 1? That’s because it’s spread throughout the page & also on the meta description tag. Try this technique and let me know how it goes. I’m anxious to know how much your conversion rate goes up from getting a Google double listing!